To find out more about SBP slings and to explore fabrics, colors, and other features, please use the links at the top of the page. I know there is a lot of information on the site -- all included because of the emails I've received over the years -- but 90% of the questions I get are answered on those pages. I recommend reading the Anatomy, Construction, Shoulder Style, Sizing, and Choosing a fabric pages before you order -- they will show you how my slings are sewn and help you find the right size and style. Most people will wear the size that corresponds to a snug t-shirt, and that is the same suggestion I will make if you email me about sizing. The Construction page will show you how my slings are sewn, and the Shoulder Style page explains the pros and cons of each of the shoulder styles (that's the way the fabric is folded before the rings are sewn in). Finally, I do offer several types and weaves of fabric, and the Choosing a Fabric page will help you choose which one is best for your lifestyle. 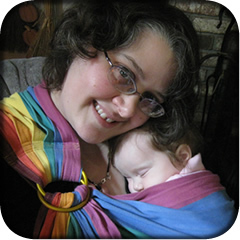 If you plan to order a wrap conversion ring sling (that's a ring sling made from a woven wrap that you send or have sent to me), please read the wrap conversion information page, as it is a very comprehensive guide to everything you will need to know. It looks like a lot, but every question I have been asked about having a WCRS made is answered there. For more information about infant safety in carriers and other devices, please read this important sling safety information, and this about general infant safety in carseats, strollers, and the like.